Like any per­sonal blog site, I have to start with pre­sen­ta­tions. 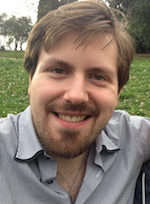 My name is Nicola Gi­gante, and I’m a 26-years-old Ph.D. stu­dent of Com­puter Sci­ence at the Uni­ver­sity of Udine. My re­search during the Ph.D. fo­cuses on (tem­poral) logic and syn­thesis of au­tomata, with ap­pli­ca­tions to ar­ti­fi­cial in­tel­li­gence, in par­tic­ular to au­to­mated plan­ning. You will re­al­ize, how­ever, that this web­site is not about my re­search, not ex­clu­sively at least. You are ac­tu­ally reading my per­sonal note­book of news, thoughts, ex­per­i­ments and opin­ions. The title1 of this blog is a tribute to one of the most im­por­tant books that I’ve ever read in my life. 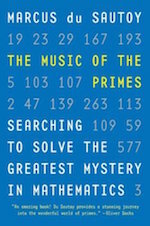 It is The Music of the Primes, won­der­fully written by the Ox­ford math­e­matics pro­fessor Marcus du Sautoy. It is in my opinion one of the best and most ef­fec­tive pieces of con­tem­po­rary non-tech­nical sci­ence lit­er­a­ture. I owe it the growth of my pas­sion for math­e­matics — and sci­ence in gen­eral — and there­fore a large part of the kind of person I’ve be­come. One of the things I care the most nowa­days is the problem of the com­mu­ni­ca­tion of sci­ence to the pub­lic, and du Sautoy is surely one of the best com­mu­ni­ca­tors alive, at least as far as math is con­cerned. This is not the first time I try to keep a per­sonal blog. This fresh restart was needed for a couple of rea­sons. First of all, I needed to set a new tone, still in­formal but more thoughtful than be­fore. More­over, I was sick of Word­Press and I wanted to build some­thing more hand­crafted, and con­cen­trate on ty­pog­raphy and struc­ture. I also switched to write in Eng­lish to be able to hope­fully reach a little more than two or three read­ers. How­ever, I will still write in Italian some­times on topics which I find would be more useful to an italian au­di­ence. For any­thing, con­tact me on Twitter or by e-­mail.